Please note that this system only contains the cameras and processor hardware. It does not include the laptop/software for analysis. 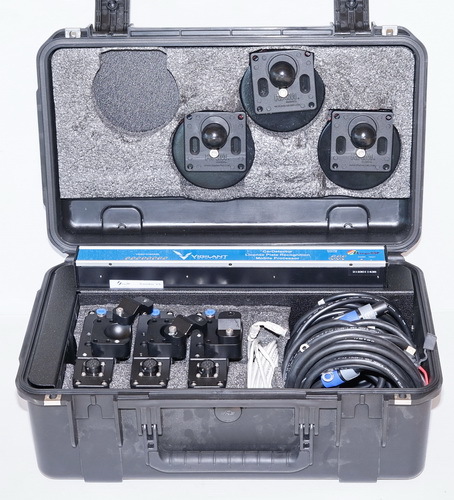 "Vigilant Solutions Mobility Kits provide agencies with a way to rapidly deploy high-performance license plate recognition (LPR) for special events, tactical operations such as roadside checkpoints, and for use on unmarked vehicles. The Mobility Kit’s portability is also ideal for agencies that do not have dedicated LPR patrol vehicles and need to share an LPR system across multiple vehicles. Operational within minutes, and managed from within LEARN, the Mobility Kit complements any agency’s LPR program. With an easy and intuitive user interface, Vigilant’s Mobile LPR provides officers in the field with real-time field intelligence to improve their safety and enhance the efficiency of their patrol. The system provides a great deal of functionality with the user’s needs in mind, but with advanced capabilities not available anywhere else..... Uses up to four (4) dual-lens LPR cameras, each with integrated Digital Signature Processors (DSP), and advanced imaging and recognition algorithms to provide the most advanced mobile LPR system available." The item is sold with a 30 Day Warranty.